1. List the basic properties of soft tissue. 3. 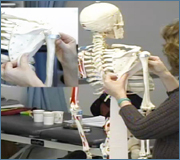 Identify specific muscles and anatomical structures relevant to the upper and lower body. 4. Describe the basic palpation techniques. 5. Describe the use of soft tissue treatment as an adjunct to an overall treatment program. AOTA Domain of OT Category 1, Texas CE Type 2, NBCOT PDUs, CABOT Advanced Practice in Hand Therapy APP-H39, approved by the New York PT Board, California PT Board, Illinois PT Board. For other State PT Board approvals click on CEU Course Approvals on the CEU Course Listing Page.